Manufactured using the same rigorous production process as their Government Model receivers (see description on this page), Nighthawk's 1911 slides are precision machined from high-grade stainless steel forgings. They provide oustanding strength, quality, and customizability for any high-end 1911 build. Offered in separate models for a standard .45 ACP or 9mm barrel (excellent choice for a racegun), these slides are available with precision-cut dovetails for Novak front and rear sights, or a plain, Smooth top so you can cut dovetails for the custom sights of your choice. Novak cut model includes aggressive front and rear cocking serrations, while the Smooth slide also has Smooth sid Mfg: Nighthawk Custom SPECS: Stainless steel, matte finish. 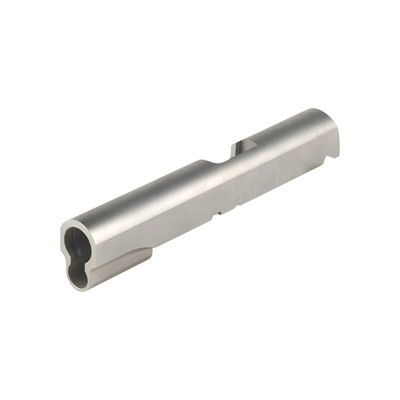 Accepts 5" Government model barrel in .45 ACP or 9mm. Gunsmith fitting required.